I couldn't read anything from the site until i remembered that google can translate the page for me. Has anyone had any experience with this camera. I have seen videos on youtube. It maybe marketing but it is interesting that one of the features are a F2.0 lens. That will help with low light situations, but how much noise is in the video. 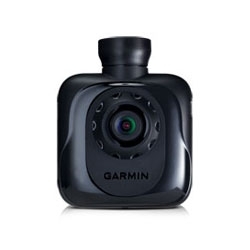 The Garmin GDR 35 is an interesting camera released in December 2012. 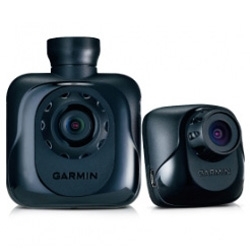 It can be used as a single camera to record at 1080p at 30fps, has GPS and G-sensor. Cost is $230 digigomart on Ebay. Overall, video quality appears good during the day but average at best for night. As a single lens camera, this camera appears to be a bit expensive for the quality. However, if you buy the separate Garmin GBC 30 camera or the GDR 35D package this can be used as a dual lens system (unfortunately I haven't seen the GBC 30 or the GDR 35D package for sale). As a dual lens system this is more interesting. Both cameras record 720p at 30fps (only a few dual camera systems do this). Day video quality appears to be good. I couldn't find any night videos but I would imagine they are below average given the night video quality at 1080p. I like the size and the ability to use it as a single cam or dual cam. The price of the dual cam package is about $310 USD on the Taiwan sales sites. Really the main drawback is the night quality. I wonder when Garmin will decide to market these dash cams outside of Taiwan. Just if I could try this one... I hope it shows up on amazon one day. That video looks pretty good. The lighting seems to be good for night driving. I think as more videos come out we can see if this camera is a winner. Does anyone knows, what is the main cameras maximum resolution in "dual" mode? Can the front view still be recorder at 1080p in "dual"? Or resolution is automatically reduced to 720p@30fps as a maximum possible ? To me this is #1 question so far. The front camera records 1080p at 30fps only when it is used without the rear camera. When the rear camera is attached, both cameras record 720p at 30fps. 720p is the max in dual mode. I just ordered a cr500, but I may sell it to get this one. ... When the rear camera is attached, both cameras record 720p at 30fps. 720p is the max in dual mode. Thanks DashCamMan ( also thanks a million for this great site !). I am also much concerned about the re-ability of this new Garmin camera. The older model GDR-20 had so many issues, that we simply stopped to sell them after first 2 month. Can't wait to see if Garmin have learned their lessons. Has anyone tried contacting Garmin USA to see if they ever plan to sell it here in the US? It is always possible that if there is enough interest in it here that they would bring it over. Much more afford single camera version of the gdr35. But IQ so far in low light are poor. The video has a lot of bloglines and noise! The Mivue 358, Aiptek X3, Abee V32 prices seemed to have come down recently. You can find some for under $150. They are Ambarella processor based cameras so they perform good in the day but have average / below average night time quality at best. If looking at these cameras, you need to compare them to the F500LHD, GS1000, etc. Similar specs but I hear the build quality is better for these name brand Taiwan dash cams. Do think that can Dropbox me a original file? Once u get it? I want to see what it looks like without youtube compressing the file. Oh yeah, how much did it get it for and where? eBay is the only place I can find it and it is $300-$340. For the dual camera version. Yea, I used ebay. I paid $280 usd incl shipping (single camera) from "navi-world"
The $340 models on ebay are usually the GDR35D, the "D" version includes the rear camera. I didn't think I'd use the rear cam, and thought it would be annoying if it was always in my field of view. Hope this camera turns out ok. I like Garmin's great idea of having 2 videos in syncro (from front and rear), on the same card. Easy to analyse events after accident. But ...would buy such device ONLY if them could make both recordings @ 1080p . So far maybe the better option is to put WiFi enabled DR500GW in the back, + another Blackvue in the front. Plus: can have a LIVE rear view on my 10" Tablet for parking, by a WiFi. I think two simultaneous 1080p recordings is too much for any chipset and the costs will be too high for a normal dash cam and supposed bigger size or heat issues. I always said that for traffic recording the 720p is perfect also because of files size. And I said too that 720p or 1080p, or HD is just a resolution, not a quality. So you can see better 720p than 1080p. Just compare a korean 720p with some unknown chinese 1080p. And if the chinese 1080p will look bad than your DR500GW, why to waste space for 1080p? The quality of a recording start from CMOS lens. Software can't replace bad lens, but good lens can help a lot even an immature software. And if a camera offer almost the same size for 720p and 1080p than again the 1080p is just a resolution because the Quality Factor (Q factor) will be smaller for 1080p compared to 720p. DashCamMan of this blog should change the quality from Poor to VERY F**KING GOOD in the comparison chart. Night vision looks amazing, why did DashCamMan rated it as poor? Looks like I'll be buying the Urive MD-8000P instead.